Anyone who has used Bluetooth headphones will probably know that the controls to change volume, skip a track and pause music can be a bit of a faff. Sony has fixed that problem though by introducing the the MDR-1ABT headphones, which have a touch sensitive panel to control music playback. The new control method is good because it allows you to use simple gestures to perform the action you want. You no longer need to blindly fell around and hope to hit the right button. Instead, a swipe up or down increases or decreases the volume. Moving from back to front skips forward, and the reverse moves backwards through your playlist. A double tap will play and pause the music too, which is very natural. The built-in battery lasts for 30 hours and Sony has designed these headphones for its new High Resolution Audio branded range, so you can be sure the quality will be as good as possible. Although Bluetooth isn't the best possible quality, Sony has a technology called LDAC which allows much better quality, from compatible devices. That means the best results will be from one of Sony's new high-res players, or its Xperia Z3 phone. The good news too is that if you forget to charge them, you can use the 1ABTs as regular, cabled headphones. Charging takes about four hours, and is done over USB cable. If you don't have that long, you can get 10 hours use from a one hour charge. 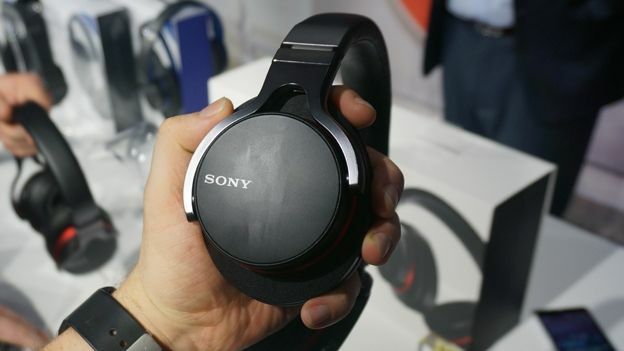 We got our hands on the MDR-1ABT headphones at Sony HQ, and they worked pretty well. The control feels really natural, they're responsive with little or no lag and they sounded pretty good too. We'll reserve our full judgement until we get a longer listen, but these seem to be a decent set of cans.